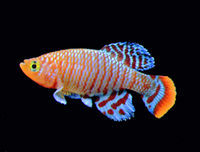 I recently got a batch of killifish eggs from the Internet. The eggs came in a bag of peat moss and its almost dry. And they were sent to me in an envelope! These eggs are really cool. The eggs are from the species Nothobranchius Rachovii. I put the eggs (together with the peat moss) into a small rectangular plastic container (which I "borrowed" from my wife). My wife (and I suspect many women) likes to collect plastic containers, but that's another topic for another day. I added water which I have aged for a day and two hours later, baby fishes start hatching! The hatching continued for three days and a final count gave me 40+ hatchlings! Not bad, considering that the bag had 50 eggs. I transferred the baby fish into another plastic container (also "borrowed" from my wife) with aged water. I didn't have a turkey baster (as recommended from the site http://www.killies.com/hatching1.htm), so I hunted around the kitchen for something similar. Finally, I used a medical syringe without the needle part. The newly hatched fish are really small (you need bionic eyes to spot them), so the medical syringe was good enough. I sucked them out of the original container and put them into another container. The reason for transferring them to another container is because I want to extract the peat moss with the unhatched eggs in the first container. I'll put water in them in another two weeks and sometimes, more fish might be hatched. As for the baby hatchlings, I am feeding them Liquifry.